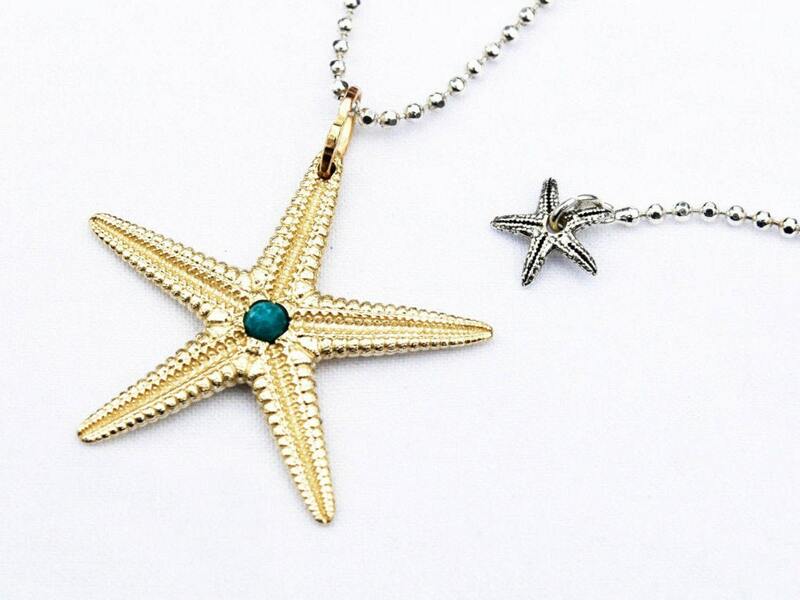 Large Yellow Gold Starfish Charm with Genuine Turquoise Center-Ready to ship. 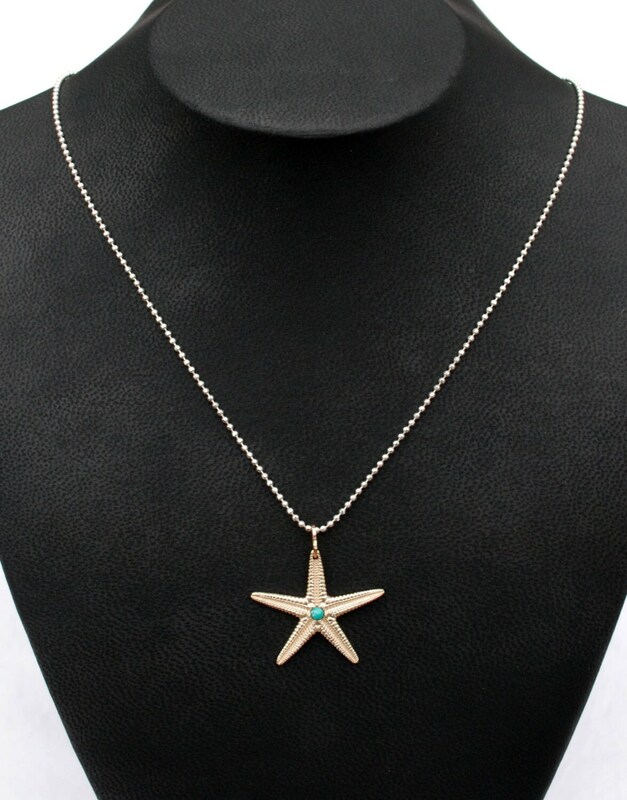 This solid cast 5k yellow gold Starfish is set with a 3mm round genuine turquoise ball at it's center and hung on an adjustable sterling silver diamond cut ball chain. The Starfish measures approx. 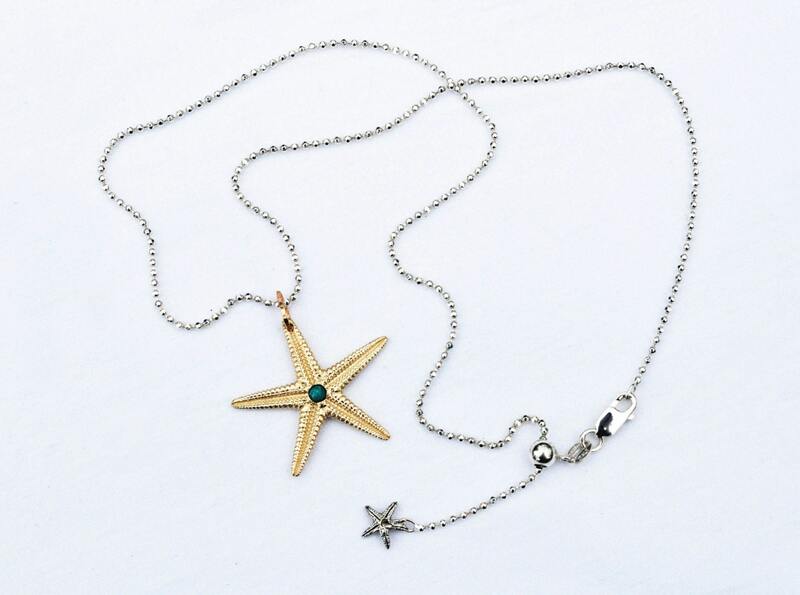 1 1/4" across (3.1 cm) from point to point and the chain, which adjusts between 16" and 18", is embellished with a tiny sterling silver starfish at it's end. 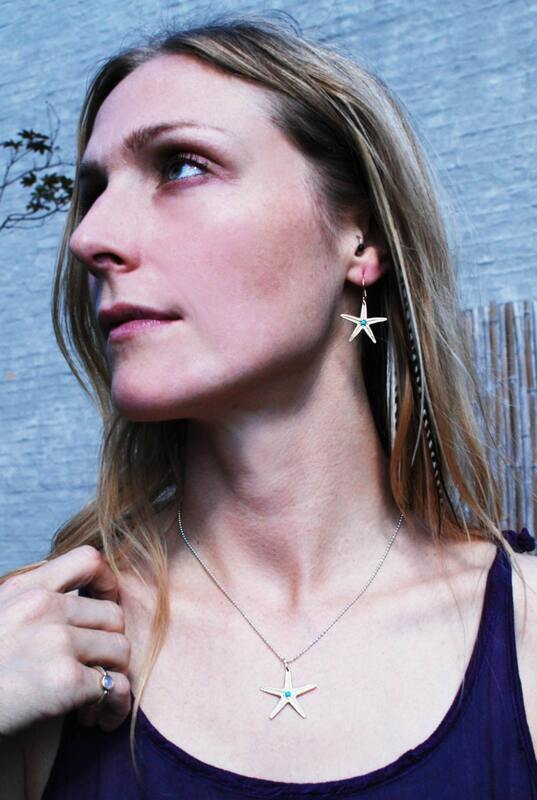 Available as Star charm only or hung on chain. One of a kind. 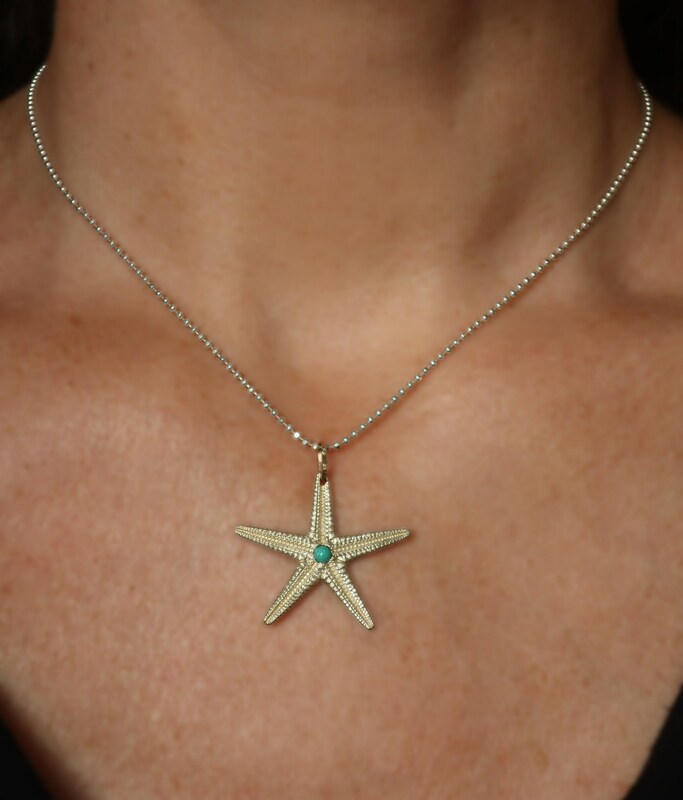 Symbolically the Starfish or Stella Maris represents infinite Divine Love, regeneration, brilliance, intuition and salvation in troubled times. It is a beautiful emblem of love and endurance. In 2014 I decided to start having a small variety of my pieces cast in 5k. I chose to do this so that people could more easily afford and enjoy wearing my gold rings, earrings and bracelets . I find it to be a nice looking alternative to the more expensive higher karats. I wear a 5k ring on my own hand and several 5k bracelets all the time. They retain their luster, they are sturdy and as they are solid there is no coating to wear off. However , in some cases 5k gold may darken over time and sulfurous "hard" water can cause quicker /darker oxidation. This can usually be remedied by rubbing the piece with a jewelers cloth or by cleaning in an ultrasonic cleaner. The 5k gold alloy contains approximately 20.85 % pure gold. It also contains silver, copper & zinc. Please understand that 5k is difficult to test on electronic gold testers and most standard jewelers/ jewelry shops do not have equipment to test karats under 10k. If you need proof of the karat of your 5k gold piece for any reason, please contact me and I can send you an X-ray scan certificate that shows the percentages of metals in the alloy from my caster.